My niece, Kristin, recently had a jewelry party and she invited me to stop by for a drink and a nosh. Frankly, I had no plans of buying any jewelry, (which she knew when she invited me) but a party is a party, right? The more the merrier! So, I was happy to stop by. She had a tasteful variety of hors d'oeuvres, some sweet, some savory, and ALL so delicious, especially these cookies! They're so buttery and chewy! As soon as I took a bite, I knew I wanted the recipe. She told me she got the recipe from iVillage.com, only she made a slight change. 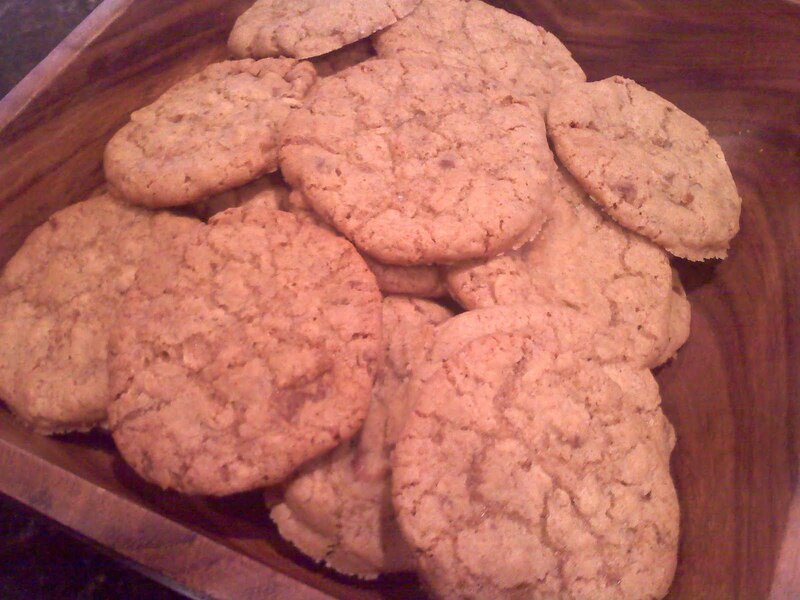 When she made them, she used whole wheat flour instead of all purpose flour, which worked absolutely perfectly. I'm sure yours will turn out perfectly as well, regardless of which type of flour you choose. Oh! Here's an idea.... Make a double batch of dough, roll them into balls, and store them in the freezer for up to three months. Then whenever you want some home baked cookies, just bake up a tray or two! Wait, actually, I think you should bake up a batch, like, right now! 1. Position 2 oven racks in the middle and upper third of the oven. Preheat the oven to 350°F. Line 2 baking sheets with parchment paper. 2. Sift the flour, baking soda, salt, and cinnamon together. Set aside. Put the butter, granulated sugar, and brown sugar in the large bowl of an electric mixer and beat on medium speed for about 1 minute, or until the mixture is smooth. Add the egg and vanilla and mix on low speed until they are blended thoroughly, about 15 seconds. Stop the mixer and scrape the bowl during this time. Decrease the speed to low and add the flour mixture and oatmeal. Stir in the crushed toffee. Using 2 tablespoons of dough for each cookie, roll the dough between the palms of your hands to form 1 1/2-inch balls. Place the cookie balls about 2 inches apart on the prepared baking sheets. 3. Bake the cookies until golden brown, 12 to 13 minutes. After 7 minutes of baking, reverse the baking sheets front to back and top to bottom to ensure even browning. Watch the cookies carefully as they near the end of their baking time. 4. Cool the cookies on the baking sheets for 5 minutes. Transfer the cookies to 2 wire racks to cool completely. Makes about sixteen 3-inch cookies. Notes: Lining the baking sheets with parchment paper will prevent the melted toffee from sticking to the baking sheet. The bottoms of these sweet cookies can burn easily, so watch the cookies carefully at the end of their baking time. To crush the toffee, leave it in its paper wrapper and crush it with the flat side of a meat pounder. Unwrap the toffee and break up any pieces larger than 1/2 inch. To Freeze: Place the bottoms of 2 cookies together and wrap them in plastic wrap. Put the wrapped cookies in a metal or plastic freezer container and cover tightly. Label with date and contents. Freeze up to 3 months. To serve, remove as many cookies from the freezer as needed and defrost the wrapped cookies at room temperature. Serve within 3 days. Usually, when you think of a stromboli, you think of pizza sauce and mozzarella or provolone cheese wrapped up and baked in a hearty dough, right? Sometimes you add pepperoni to it.....basically anything you'd put on a pizza, right? Well, how about something completely different? This recipe takes all of the components of a Reuben sandwich and rolls it all up into a fabulous stromboli. Brilliant! Now why didn't I think of that? I recently received this recipe from my sister Cathy, who got it from her friend, Jane. As soon as I read it, I immediately knew I'd soon be making it. It's so simple! I've always loved a good Reuben sandwich, and this is a great twist. Thanx Jane! And of course, I love that she serves it with thousand island dressing. It's a must! How can you have a Reuben without it, right? Oh, and btw, a big hello to Jane's mom and her bridge ladies! Hello Ladies! I lost my recipe but this is what I did. one big-so what ever you want to do. think mayo and mustard are really just to hold together. It also calls for caraway seeds but I rarely use. I usually serve with thousand island dressing. I made it a couple times. The first time, I chopped everything up, and then rolled it up in the pizza crust, then baked it at 350 for about 30 minutes. It turned out great. SO delicious! But here's the thing.. I was missing the swirl design in the cross section of the cut stromboli. So, I tried it again, and this time, I just did a little spread of mayo and mustard on the dough, then I layered the pieces of corned beef, the sauerkraut, then the cheese. Now when you roll it up, bake it and slice it, you have the pretty spiral design that I missed with the first technique. Whichever way you decide to make it, I'm sure you'll love it! Oh, and for the dressing, choose your favorite brand, or make it fresh! If you'd prefer to have a milder sauerkraut flavor, either use a little less, or rinse it well, then squeeze it dry before adding it to your stromboli. I honestly don't know where I got this recipe. I vaguely remember getting some sort of blueberry recipe from my sister, Jeanie, about a million years ago. (a blueberry crumble, mayhaps? I can't remember). Anyway, I think this came with it, but I'm not exactly sure. The other thing that lingers in the back of my mind is a story of how someone was serving pie and didn't have any whipped topping to serve with it, so he used what he had on hand, and this was the result. None of his guests could guess what the main ingredient was, so he called it "Top Secret" (as in "secret topping"), and there you have it. I've made this a million times and it's always a huge hit. Actually, come to think of it, I'm not even sure if this is the exact original recipe. You know how I'm always tweaking recipes. So this is how I make it now. It's absurdly simple to make and I know you'll love it. Serve it as a topping for any fruit desserts, fruit pies, fruit salads, or even as a dip in the center of a fruit tray. Sprinkle it with a little cinnamon and you'll be in heaven! And if your guests are wondering what the topping is, tell them it's Top Secret! Simply place all ingredients in the bowl of a food processor and process for several minutes, until it's satiny smooth and until the sugar is dissolved. Cover or place in an airtight container (I always just store it right back in the cottage cheese container). Chill until ready to serve. -If you don't have a food processor, you can also use a hand blender . You can probably use a regular blender, but you might have to stop several times and use a spatula or spoon to help things along. -Feel free to reduce the amount of sugar if you'd prefer a topping that isn't as sweet. I've used as little as 1/4 cup, and it's still delicious, but I must say, I do like it better with 1/2 cup!